Four Democratic senators who voted against protecting newborns sponsored a bill designed to protect baby cats. Senators Jeff Merkley (D., Ore.), Cory Booker (D., N.J.), Gary Peters (D., Mich.), and Tom Udall (D., N.M.) cosponsored a bill designed to put an end to animal testing using kittens. The KITTEN Act of 2019 came after it was revealed that the Department of Agriculture was testing suspect Chinese meat on cats, posing a potentially fatal risk to the felines. It was introduced about a week after all of those Democratic senators voted to block legislation that would have required doctors to provide medical care to newborns who survive abortion. The contrast between those two positions prompted public outcry from those working to safeguard the lives of children. Lauren Fine, spokeswoman for Rep. Steve Scalise (R., La. ), said that Democrats should show as much compassion for infants as they do for cats. "There is nothing more valuable than human life, and as a society we must defend it at every stage," she said. "It's unfathomable that Democrats can find time to defend the lives of kittens, but at the same time are vehemently opposed to even the consideration of legislation designed to protect infants born alive during an abortion from being killed." None of the Democratic senators responded to request for comment. Senate Democrats voted down the Born Alive Abortions Survivors Protection Act in March, though three party members broke with leadership to support it. Democratic leaders in the House of Representatives have stalled similar legislation to prevent a floor vote. Scalise is now working on a discharge petition to bring the bill to a vote. Twenty-eight Democrats who sponsored the KITTEN Act also signed on to a letter calling to disband the House Select Investigative Panel focusing on taxpayer funding of research using body parts obtained from aborted babies. The Department of Agriculture spent more than $600,000 on research involving kittens, which was designed to test its suitability for humans. Taxpayers shell out more than $100 million each year on research using body parts and organs from aborted babies. The Trump administration has chipped away at that number, canceling contracts with controversial parts suppliers linked to the 2015 organ harvesting scandal. Rep. Sean Duffy (R., Wis.), a father of eight children, said it was "appalling" to see lawmakers protect cats while turning a blind eye to the ethical problems in harvesting organs from babies. "I find it appalling that Democrats are so out of touch that they refuse to stand up for defenseless babies but are more than eager to defend animals," Duffy said. A GOP aide in the Senate said the juxtaposition of the KITTEN Act and Democratic opposition to abortion survivor bills is "disgusting." He added that it lays bare the disconnect between Democratic lawmakers and voters. A vast majority of Americans, including 70 percent of Democrats, support providing life-saving care to abortion survivors. 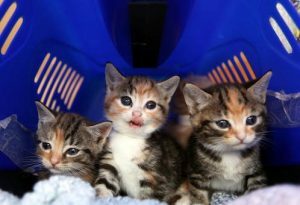 Lawmakers, however, have spurned the bipartisan consensus for humans even as they signed onto the bipartisan bill aimed at protecting baby cats. The aide said newborns should receive the same bipartisan support as protecting kittens. "When Democrats want to talk about ending ‘taxpayer-funded kitten slaughter,' they say it's just common sense," the aide said. "When millions of pro-life Americans want to end taxpayer subsidies to the nation's largest abortion business, Democrats rush to call it an extremist agenda." Pro-life activists were similarly critical of the concern for animals and indifference to humans. Tom McClusky, Vice President of Government Affairs for the March for Life, said it was hypocritical to protect taxpayer funding for abortionists if one is concerned about killing research subjects. "Many legislators miss the hypocrisy of protecting the lives of pets while at the same time failing to protect the lives of children," he said. The Department of Agriculture announced it would no longer conduct such testing in the wake of the bipartisan bill.